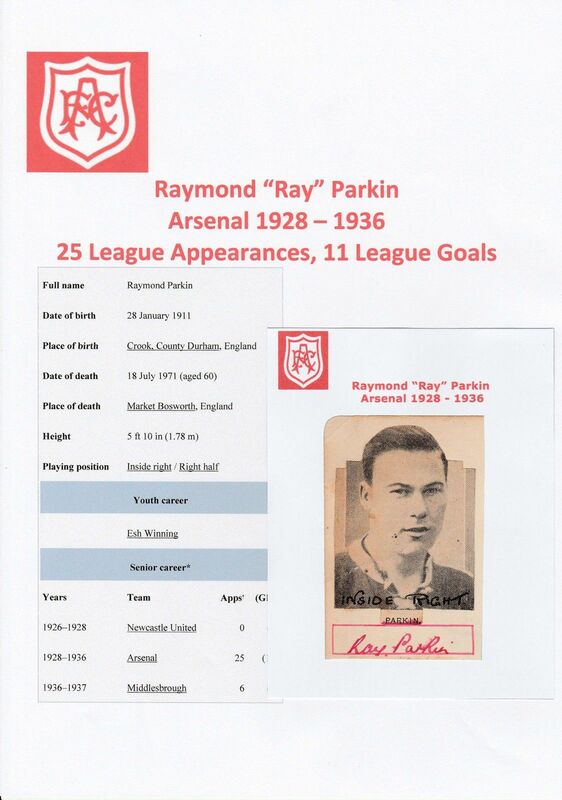 Raymond Parkin was born on 28 January 1911 in Crook, County Durham. He started his career in 1926 as an amateur, with Esh Winning FC – a team that won the Northern League in 1913 and was considered one of the leading amateur teams in that part of the country at the time. The club has folded several time since, but a new club with this name is still playing in the 21st century. Ray also played as an England schoolboy international during this spell. He signed first for Newcastle in 1926 but moved to Arsenal two years later without having played a game for Newcastle’s first team. During his eight years at Arsenal, although he only played 25 games in the first team, he managed to score 11 goals. 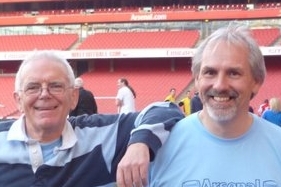 He also played 232 games for the reserves winning the Football Combination five times at a time when Combination games regularly got crowds of 7000, sometimes far more. Here is Ray’s full record – and it is interesting to note that with Arsenal he was only on the losing team five times. When war broke out he was only 28, and thus would in normal circumstances continued playing for another six or seven years, and would have totted up many more first team games. But of course by the time the war was over, so was his chance of a career in football. His first Arsenal game was the 5–1 defeat at Sunderland on 1 January 1929, just before the rise of Arsenal to dominance of the League. He scored his first two goals for Arsenal in the 7–1 victory over Bury on 30 March. But he got the games only because David Jack moved to centre forward, and Lambert was not considered ready to take up the number 9 shirt. Then as Chapman created the all conquering 1930/1 team which scored 127 goals and gained a record 66 points Ray dropped back to the reserves not playing again until September 1931. On 30 January 1932, he scored a hat-trick in a 4–0 victory over Manchester City. 1932/3 saw him play five games, including a couple as a half back, while his five games in 1933/4 saw him twice called up to play outside right. 1934/5 was another season without a game and his final game was away to Brentford on November 2 1935. He scored, but Arsenal lost. This meant that although Parkin remained with Arsenal until January 1936, he only made eleven appearances in his final four seasons, before moving to Middlesbrough for a fee of £2,500. 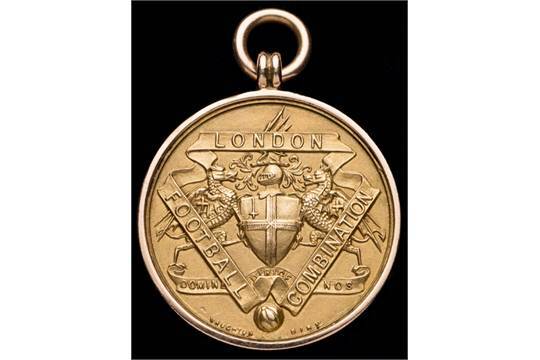 He also played once for Arsenal in the FA Cup on 13 February 1932 away to Portsmouth. Arsenal won 2-0 and went on to the final, but lost there to Newcastle. Surprisingly after two years at Middlesbrough, Ray still had only six first-team appearances, and in September 1937 he went to Southampton for £1500, where Tom Parker, was now manager. Parkin naturally scored on his debut but after 13 games lost his place to Ted Bates – who was himself of course ultimately due to go to Arsenal. Parkin however did come back into the side later in the season, playing at first at inside forward and later as right half. This picture comes from an auction of his football collection. While Parkin had a very positive record with Arsenal, losing only four times as noted above, with Middlesbrough matters were reversed. He played in six games in which Middlesbrough lost four and drew two. With Southampton in division two he played on the winning side 21 times out of 56 which combined with his being used further back in the team, explains the decline of his goalscoring. 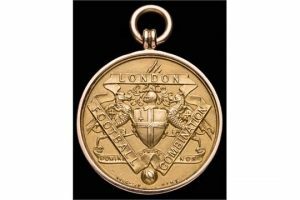 The pictures below show Ray (although I have no date for the picture) and one of his Combination medals. I have no details of Ray’s work after the war, nor of his service record, only that he died on 18 July 1971 (aged 60) in Market Bosworth, England. If you know any more please do write in.